I'm having some difficulty trying to decide whether or not I liked this book. On the one hand, it was riveting and intriguing as any sci-fi, global, psychological thriller ought to be. It had a lot of legends and history lessons and interesting topics touched upon as the main heroine runs around trying to save the day and solve her mysteries. But at the same time, it almost feels like way too much was trying to be accomplished in one very short 292 page hardcover novel. On top of that, while I'm all for suspension of disbelief and a good science fiction thriller any day, and while I'm quite open-minded to things that are beyond human understanding, I couldn't help but feel like our main heroine dives into these beliefs much too quickly. I'm not even sure at what point she goes from being a skeptical child psychologist to an expert on past life, out-of-body, literal soul-searching rituals that create enough negative energy to blow up small cities. Yes, I can see the main heroine slowly developing into a believer, but I'm afraid the progression was much too fast for my own liking. It was like watching Dana Scully's X-files persona develop from skeptic to believer in a little under eight hours of book time--whereas in the actual series, it DID kind of take her seven years to get there. It's hard to say what it was about A Vision of Fire that didn't really work for me. Did I keep envisioning Gillian's celebrated X-files persona, Dana Scully, as I followed this book's main protagonist, Caitlin O'Hara around on her "journey" to find out what is causing these strange outbursts? I kind of did. I tried hard NOT to do any comparisons, but I have to honestly admit that there were too many similarities between Caitlin O'Hara and Dana Scully to ignore. The only difference is that Caitlin has a lot less resistance towards letting herself Believe, even as she swishes back and forth on the 'I Want To Believe' bandwagon--at some points she says that she's open to possibilities and understanding, but other points she's very vehement that there are other, more rational explanations. Then she goes and starts talking about past life regression and stepping into another time, another life, with another civilization. But in the long run, it really wasn't the main character who made it a little difficult for me to determine whether or not I liked this book. To be honest, it is written very well and smacks of the typical sci-fi thriller (as already stated). To someone wanting an easy, page-turning read to pass they day, A Vision of Fire can be quite enjoyable. For someone hoping for some sort of breakthrough writing debut by a beloved media personality... I'm not sure this book really delivers. Though maybe we expect way too much more because Gillian is such a popular onscreen figure. This book is entertaining, at best and reminds me of a prolonged science fiction movie with lots and lots of things going on. In fact, at times, it might feel like the reader is being overwhelmed by the amount of material being packed into this short novel. Half the time, I'm not even sure I knew what was going on or how certain tangents connected with the main story line. The other half of the time I was still trying to figure out where Caitlin was going with her theories and why I hadn't quite caught up with what she was doing. What I did find that I liked about this book was the global, diverse feel of all the characters presented in this book. What I would have liked was a better, more in-depth look at all of these side characters, whether they were only part of this current story line, or are a part of Caitlin's life and will continue to appear in the rest of the series. But this book was mainly focused on Caitlin. Sure, there were tangents into the global impact of the negative energy being generated by these kids due to the whatever was happening to them. There was a lot to think about in terms of cultural beliefs and religious understandings. But in the end, this book was a LOT about Caitlin and her own journey to a better understanding. It just, at the same time, didn't seem very in-depth or relevant to her as a person. And in the end, the book itself was just another standard science fiction thriller with things happening and characters reacting and even stranger deux ex machina twisty conclusions that I'm still trying to understand. 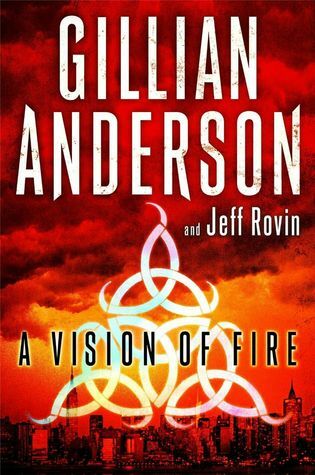 I might still pick up the next book when I get a chance as the book was not difficult to read at all, and I'm curious to see where Gillian and Jeff Rovin decide to take the rest of the trilogy. This review was originally posted at Ani's Book Abyss / BookLikes in March 2016. It's not a bad start, so far, although I can't help seeing some X-files parallels in the story's premise. Of course, being that the X-files had covered almost anything paranormal you could think of, that's an unfair comparison, because almost any action or crime thriller with a paranormal basis could be said to parallel an X-file episode. It just so happens that the idea is stuck in my head thanks to the author being Gillian Anderson. And to be honest, her name in large print on the book cover was what caught my attention first--as was probably the marketing strategy for A Vision of Fire. We all want to know how well Gillian handles authoring a book, and whether we can separate out the fact that she's a well-known, excellent actor, because, honestly, I'd like to give her a chance if she's also found a passion in writing. I know she had requested the chance to write one of the X-files episodes, though I don't remember which one. Anyway, so far A Visions of Fire is giving some promising potential. Although, like I said, I can't quite separate out the similarities between this book and any other paranormal, government conspiracy crime thriller out there. Aside from having Gillian's name on the front cover, the book isn't really standing out yet. Of course, with only one chapter into the book, it's still too early to tell. Crossing my fingers for an enjoyable, page-turning read!